The Clare-based Kilfenora Ceili Band, famous for its many All-Ireland titles, has long been known as one of the best in the business. In recent years, a new generation of players, among them Conor McCarthy (accordion) and Annemarie McCormack (fiddle), has joined and replaced some of the musicians who started the band back in the 1950s. This recording is proof that they are worthy successors to the earlier line-up. 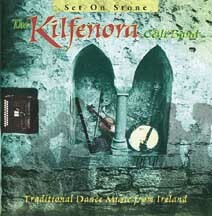 This is great ceili band music and great Clare dance music.